Meteorologists typically examine atmospheric soundings in the course of preparing a weather forecast. The skew-T / log-P diagram provides the preferred method for analyzing these soundings. This module comprehensively examines the use of the skew-T diagram. It explores thermodynamic properties, convective parameters, stability assessment, and several forecast applications. The module is designed for both instruction and reference. It also comes with an interactive Web-based skew-T diagram that calculates several common forecast parameters. I am a pilot, not a meterologist, but this is by far the best training module for skew-T I have seen to date, hands down. I can't believe that it is free. Was all useful and helpful. Great module! The only thing I would change is to make the skew-T diagram questions more user friendly when figuring out LCL, LFC, etc....would be nice if we could "mouse over" the skew-T and it would have a selection bar for choosing parallel lines for each parameter (Saturation Mixing Ratio, temperature, dry adiabats, etc). Take lots of notes during the exercises. The different values run together after a while. Also, the skew-t diagrams are hard to read. Estara este curso en español? Gracias. The lesson was very thorough and helped me gain a much better understanding of what Skew T charts are, how to read them, and how to apply them to forecasting. I felt like the lesson was too long. I think it should be broken up into sections and those individual sections should each have their own graded quizzes. That way its easier to access what specific topic you need to review. I did this for a grade. the skew-t it's from the most important tools to determined the upper air condition and make more accurate forecasting, my predict get more better after using skew-t diagram.the NWP and skew-t diagram together gives more precious information. Some of the skew-T were difficult to see well when answering questions. This made accurate answers hard to achieve. The questions were a bit challenging however they did wonders for learning about the material. It was entirely too long. It should not take over 8hrs to complete a comet module and that was me giving up early. The skew-t lines are small, blurry, and difficult to read on a computer screen. Not being able to draw on the charts also makes this difficult for someone without extensive practice. The weakest portion of this lesson and the associated quiz are the graphics, which are usually too small to adequately examine and become somewhat pixelated when using the zoom feature on a browser. The size of interactive Skew-T helped during the lesson, but perhaps there should be something of similar size on the quiz. Some of the quiz questions did not seem to be straight forward. The charts are a little hard to see especially when having to determine intersecting points. I am a veteran forecaster of 27 years in the National Weather Service and have still managed to learn a lot from this course. It was an excellent review. Show how to read the Skew-T and show how to calculate for video and animation would have been more help than just reading dry material. There is waaaaaaay too much information here for it to be processed and retained. There are so many different topics and sections of reading the Skew-T that it is difficult to keep up. Further, the tiny images used make it difficult to select the correct information/data. the amount of information presented and expected to be mastered in such a short time is impossible. It may have been helpful to have actual examples of what the weather is visibly doing while looking at the Skew-T diagrams. Great to cement to knowledge I already had, covers all things aerological! It wasn't a bad lesson, just extremely long. Took longer than I thought it would and also kind of bland. Some areas needed more images and simulations, while other areas were just fine. This lesson took me much longer than the estimated time. I think 10-12 hours would be a better estimate. The information is great, but it's so much that it's like trying to drink from a fire hose! Thank you. I enjoyed the interactive learning and hope to return to the module for revision in the future. Module is too long. Took me 16 hours to get through it. Information overload. This is a long but comprehensive module. I found it to be very useful. Overall this was a great learning format. Some of the Skew-T's that were depicted could be improved. Lines were difficult to distinguish on just a couple. A fantastic learning resource for all who want to understand how Skew Ts can be used to help make forecast on a range of different weather. Awesome module here. A Rutgers student in atmospheric thermodynamics and this really helped me learn a lot. The forecasting section was really cool, felt like I got my feet wet with actual forecasting and the tips you guys gave were great. I really enjoyed this whole lesson, I learned a great deal more about my passion. I will be visiting here again to learn more. Very clear explanations, an excellent resource for educators. I began with little understanding of skew-T analysis and this module brought me to a much better understanding. However, expect to spend more than 8 hours if you have little skew-T background but want to learn from the module. Comprehensive and highly educational. Soundings graphics are often difficult to read due to size and/or quality. Paste them into a graphics program and print full-size, to get the most out of this course. The goal of this module is to teach the novice forecaster to effectively use the skew-T/log-P diagram. After completing the module, they should be able to read and interpret a sounding plotted on a skew-T/log P diagram and apply that information to a weather forecast. Given a skew-T/log-P diagram, identify and describe the various lines. Read or calculate the thermodynamic properties at various levels. Determine the convective levels, including the LCL, CCL, LFC, MCL, EL, and MPL. Determine stability indices such as LI, SSI, KI, TT, and SWEAT and use them to assess the potential for severe weather. Describe how CAPE and CIN are determined. List and describe the different types of lapse rates and relate them to stability. List and describe processes that alter stability and give examples of common cases where those processes occur. Given a suitable synoptic environment and a sounding plotted on a skew-T/log-P diagram, interpret the sounding with regard to common forecast problems. 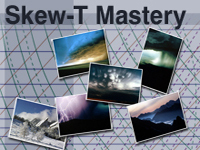 March 2014: This update to the 2006 version of Skew-t Mastery brings the original content to a new, easier to navigate format.